There has certainly been no shortage of market sectors and industries contributing the stock market’s blast to new highs this past year. It almost harder to find areas that aren’t at all-time highs than those that are. Among those conspicuously absent from the new high list, however, have been a couple of health care heavyweights — biotechnology and pharmaceuticals. Each of these prominent industries topped out back in 2015 — the biotechs in bubbly fashion, as we noted at the time. In fact, the biotech blowoff was so pronounced that we surmised the subsequent collapse spelled the demise for biotechs. However, in the present-day rotation-happy market, every dog eventually has its day, including the biotechs. 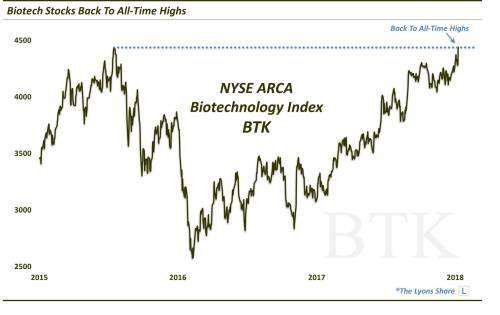 As evidence, we see that yesterday — a full 18 months and 30% after the S&P 500 overtook its own 2015 top — the NYSE Biotechnology Index (BTK) finally closed at an all-time high again. Will this new high lead to a meaningful further burst in the biotechs like the S&P 500 and other indices have experienced? It’s possible. However, ideally some form of consolidation/digestion should occur first in order to re-fuel the sector so that is has the energy to sustain a durable breakout and extension higher. That said, considering the melt-ups we’ve witnessed recently in a number of other sectors, it’s also possible that the 2015 highs serve as little more than a speedbump to biotechs as they attempt to catch up to the rest of the market. The iShares NASDAQ Biotechnology Index ETF (IBB) closed at $111.98 on Friday, up $0.75 (+0.67%). Year-to-date, IBB has gained 4.88%, versus a 4.14% rise in the benchmark S&P 500 index during the same period. IBB currently has an ETF Daily News SMART Grade of A (Strong Buy), and is ranked #2 of 33 ETFs in the Health & Biotech ETFs category.